The famous Spanish Riding School is located in the centre of Vienna, part of the large Hofburg building (including the seat of the Federal President of Austria). The Spanische Hofreitschule (German name) is about 10 minutes walk from the central St. Stephen’s Cathedral. 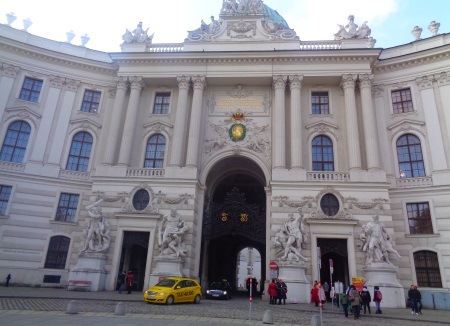 It is the most famous riding school in the world and one of the biggest tourist attractions in Vienna. Every day hundreds, not infrequently thousands, of visitors come to the Spanish Riding School. Very popular is the visit of the morning work. In the large building, more than worth seeing, a public training with the famous white Lipizzaner horses takes place every morning. Several riders practice with the horses is the large hall. Several hundred spectators have two floors above the horses and riders place. The morning work is well known and even in winter well attended. The demonstration lasts 2 hours from 10 am to 12 pm and is stylishly accompanied by classical music. During the short breaks when the horses change there is interesting information about the Spanish Riding School and the great white horses over loudspeakers. The morning exercise begins every day during the week at 10 am. Thus almost all visitors come around 10 o’clock, accordingly large is the crowd and this time. On a Tuesday in February, i.e. in absolute low season, we waited about 20 minutes at the cash desk. We only got a seat with a good view with a little luck. But there are also many standing places with quite good visibility. Tip: On the 1st floor one sees and hears more than on the 2nd floor. The Spanish Riding School Vienna is always open from 10 am to 12 pm. You can almost always visit the morning work at the Lipizzaner Horses School on Tuesdays, Wednesdays, Thursdays and Fridays. Monday and Saturday are also rarely open. A detailed overview of all days with opening hours can be found on Getyourguide under „Select date and participants“. Lipizzaner horses are almost always white, at least from a certain age. We liked the morning exercise. You can’t see the big jumps and tricks, but you can see some other things. We liked the huge, artistic building, almost an indoor stadium. You can see loosening exercises, different running styles and can watch the great horses and riders without time pressure. The view of the horses from above is excellent. 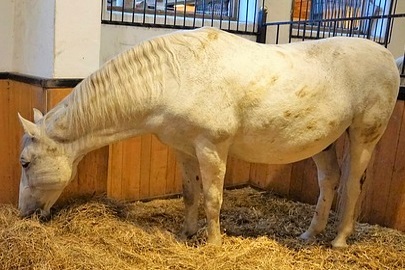 Most horses are white, but a few of the Lipizzaner are also dark. With a bit of luck you may see a dark Lipizzaner stallion during morning exercise at the Spanish Riding School in the centre of Vienna. There is a cafe in the Hofreitschule Vienna. In the afternoon there are guided tours through the Riding School on some days.